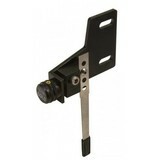 The GOLD MICRO-CLICKER is the only Micro adjustable clicker available. Designed by Dan Fisher and tested by the top recurve shooters in the USA. The micro adjustment indexes .005 (.12mm) per click for precision on the field adjustments. It mounts under the sight with complete adjustability to fit all bows. The clicker is made of hard anodized aluminum, brass, and stainless components with a stainless steel clicker (blade) that is also completely adjustable up and down and straight or 15 degree off-set.